Yala National Park is one of the most famous parks in Sri Lanka. Yala has the title of being home to the highest density of leopards in the entire world. There are five blocks and a strict nature reserve that form the national park. The total area is 9782 kilometers (3782 miles). 5 What time should you arrive at the Yala national park gates? 6 Why does it matter what time you arrive at the gate office? 7 Where is Yala National Park? 12 How big is each block at Yala National Park? This is very strictly regulated. The park opens at 6 am sharp. It is important to leave your accommodation much early! The distance to the gate may not appear far but it takes longer than you anticipate. Travelling to the gates can take up to an hour. 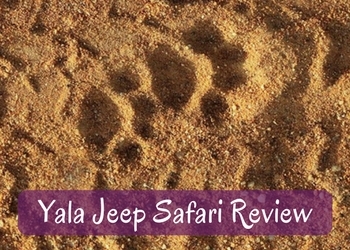 It is essential your jeep is out of Yala Park by 6 pm unless you are camping within the park grounds. The driver will get very nervous if you are late to leave. The government officers will mark off car number plates as you leave. There are also officers that patrol the park around the closing time. The order of arrival will dictate who gets through the gates first! As soon as you arrive, someone needs to physically line up at the park office to ensure the tickets are purchased. We arrived very early one morning but our guide didn’t bother to line up. So, we ended up far back in the jeep line – we could have slept for another hour and still been in the same spot of the line! There are a foreigner and a local price structure. To be completely honest I was very annoyed at the cost! When we went in 2017, the price was around 5500 Lankan Rupees or approximately $45AUD/$35USD (for 1 adult, 1 child, 1 driver, 1 guide and jeep cost). A local ticket was around $1 and kids were free. If you go on a tour, obviously the expense of the guide and jeep is shared among everyone so you do not foot the entire amount. What time should you arrive at the Yala national park gates? There are hundreds of jeeps around Yala National Park. Arrival should aim to be at least an hour prior to the gate opening, so 5 am. During the high season, you should aim to arrive 1.5 -2 hours prior to opening. Yes, arriving at the gates at 4 am! If you are doing the jeep safari without a company due to cost restraints (and I would avoid this when possible) you need to ask how far the gate is to ensure you arrive early. Staying as close to the gates can mean more sleep! Our wake up times varied from 4 am to 6 am. Depending on where you are staying and your proximately to the gate will dictate your wake up call. Why does it matter what time you arrive at the gate office? For morning or dawn jeep safaris at Yala National Park, the arrival time is essential to get right. Due to the sheer number of jeeps, you want to be in the first few jeeps to go through the gates at 6 am! There are many rouge jeep drivers who just randomly drive around hoping to bump into a leopard. They speed around the park. This is obviously a bad ‘plan’. You don’t want to be behind that jeep! Their behaviour can easily scare the leopards (and other animals) away. You want fresh roads! Ideally, you want fresh undriven roads. Then your guide can do what they are trained to do – track! Obviously, the further back in the line you are, the more jeeps that have driven over potentially vital clues to spot wildlife. Unfortunately, many drivers are not educated about this and just hoon around waiting for a call to say they have spotted a leopard. You want to be in front of other jeeps so that if there is an encounter – you will see it! Your best shot is to be alone and without the other jeep drivers. The better guides know this and ensure you are alone whenever possible. For a dusk jeep safari, it doesn’t matter what time you arrive at the office in terms of ‘scaring animals’. If you do want a government guide to accompany you (recommended) early afternoon will give you the best shot at securing someone. 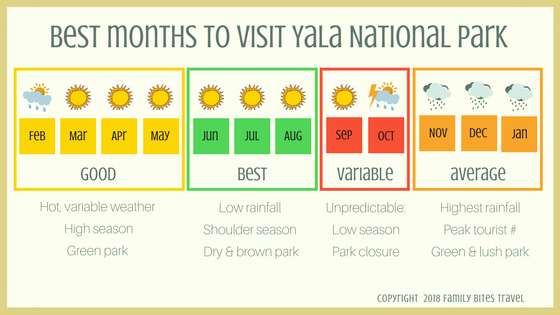 Where is Yala National Park? Yala National Park is located on the southeastern coast of Sri Lanka. It is located in two provinces: Southern and Uva. The nearest town you can stay in proximity to Yala National Park is Kataragama. The nearest tourist hub is the town of Tissamaharama. 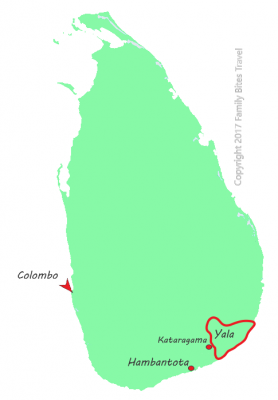 The closest city to Yala is Hambantota. The distance from Colombo to Yala National Park is approximately 260 kilometres. The drive from Colombo to Yala National Park is around 9 hours. There are a number of other national parks that border Yala National Park. To the west is Lunugamvehera National Park. To the east of Yala Park and continuous with the Yala Strict Nature Reserve is Kumana National Park. This park along with Kudumbigala Sanctuary is in the Eastern Province. Weather in Sri Lanka is not clear-cut and quite complicated. Yala National Park is in south-eastern Sri Lanka so gets affected by both monsoonal seasons. Yala is a dry semi-arid zone so does not experience rainfall like the other parts of the island. Yala National Park is more affected by the north-eastern monsoon and the inter-monsoon seasons. The heaviest rain is from October to February. The wettest months are November to January. Unlike the much of the west coast, Yala receives very little rainfall during the southwest monsoon season although it can be the windiest time to be at Yala NP. The driest months are June to September. The temperature during the day is consistently low high 20’s to low 30’s. The Yala Park, known as Ruhuna, in the 1900s was a designated wildlife sanctuary. Although in reality, it was a shooting range for the British residents. How big is each block at Yala National Park? In 1938 Ruhuna was renamed, and along with Wilapattu was the first two national parks established in Sri Lanka. Ruhuna was the first area that was established, that is they are now known as Block 1. The initial size of Yala National Park was 14,101 hectares. In 1952, Block II was added giving an additional is 9,931 hectares to the area of Yala National Park. Subsequently, other blocks were added to the area of Yala National Park. Block III, the most extensive block of 40,775 hectares was added in 1967. Block IV is the second largest block 26,418 hectares and was added two years later in 1969. The final addition of land to Yala National Park was Block V and is the smallest of 6,656 hectares was added in 1973. Block one is very easy to access. There are two gates to access block I of Yala National Park. Palatupana is the most popular gate and is a 15km drive east of Tissamaharama. Katagamuwa is the second most popular gate and is located 14km east of Kataragama. There is no direct access to block two, you have to access this block via block one. The accessibility is harder as there are specific rules for visiting block two at Yala National Park. Due to the remoteness of block two, there are specific rules to go on a jeep safari in this block. Specifically, you need to be in a 4WD vehicle and there is a minimum of a 2-jeep convey. e. These two gates are accessed along Buttala-Kataragama road. Galge gate is a 41km drive north of Kataragama.